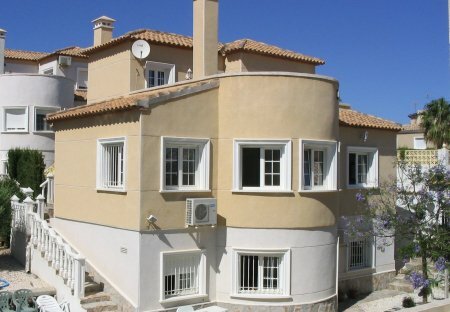 Rent villas and apartments in Las Filipinas, Spain with private pools. Book affordable holiday rentals that are near a beach and golf course. Great reviews. Sleeps 12. 6 bedrooms. Walk to shops/bars. Clean beaches. Air conditioning/heating and ceiling fans. British TV. BBQ. Cot. Short transfer. Popular choice. Golf. WiFi internet. This Fabulous XL 3 Bedroom House Set a very quiet area of EL Galan just a stone's throw from La Fuente Commerical Centre and a few minutes drive from Villamartin and Villamartin Plaza. 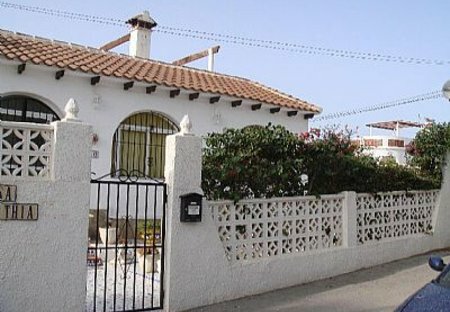 This cosy holiday home is situated in quiet cul-de-sac in a peaceful residential area. This charming holiday home with a pool is located in a quiet side street of the popular urban area, Blue Lagoon. The roof terrace offers a beautiful panoramic view of the surroundings. This cosy little holiday apartment on the outskirts of San Miguel de Salinas is just perfect for Families who like to spend their holidays right near to the pool area. Fully Air Conditioned well presented 3 bedroom house situated close to all amenities, consisting of: 1 double bed and 2 twins 2 bathrooms, lounge, kitchen, dining area and two elevated sun terraces. This cozy terraced house in the urbanization Blue Hill near San Miguel de Salinas offers a large sunny roof terrace with sea view. Blue Lagoon, 2 bed 1 bath detached villa with private saltwater large pool great for the family. Location near several golf courses, beaches and shopping plus more. Local amenities nearby. This holiday home in the urban area Bellavista with beautiful views and a shared swimming pool area is the ideal place for every season. It is furnished with very elegant and modern facilities. The perfect 2 bed villa with private pool in Blue Lagoon great for families or friends on holiday. Close to all amenities, golf, beaches and of course sun! What better way to enjoy a holiday in Spain.